And once there, on the darkening path between the trees, look up to the glowing sky and watch the circling doves and wheeling swallows. For me there is something profoundly exciting about seeing a forest from a little distance. It fills me with longing. I first remember feeling this way as a child in Connecticut. I would sit on the school bus, day after day, looking out of the window as we drove past miles of woodland and wish that I could run through those curtains of branches rather than spend all day sitting in an overheated room under fluorescent lights. The forest of the imagination is still with me, a tingling alternative to the patterned parade of human habitations. Inside the concealing branches, I can touch wave upon wave of leaves, fronds, buds, flowers, foaming moss, spreading fungi, concealed glades and secret streams. In this panel from the Ghent Altarpiece we see a procession of ‘holy hermits’ coming out of the woods in order to worship the lamb of God represented in the central panel. Hermits take themselves out of normal human society and live in the wild in order to concentrate on the world of the spirit. They may choose a mountain, cave or glade in the woods, or in the case of Fred (Jozef Stawinoga), a tent amongst the trees on a roundabout on the Wolverhampton ring road http://www.bbc.co.uk/programmes/b0510d9t . A few trees can transform an epicentre of dirty, noisy traffic into a piece of wilderness to rest a troubled mind. In the forest, trees, not humans, are the dominant species. The tradition of going into the wild woods and emerging transformed is as fundamental to fairy tales, and other fictions, as it is to religious traditions. 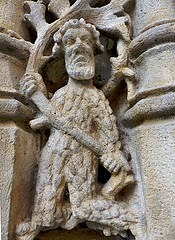 Across Medieval Europe the motif of the wodewose (wild man of the woods) flourished, a common character in literature and the visual arts. 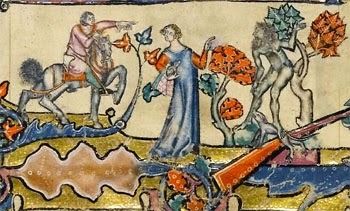 Many old tales tell of men, horrified by the evil they have done or stricken by grief, who go to the forest and become a wild man, eating only plants and raw meat, growing hair in all the wrong places and generally leaving their human reason for a period of time (Arthurian examples include Yvain and Merlin). In the forest, it was expected that the normal rules of society and civilisation would be suspended. It was also expected that the forest would do its work, turning the anguished into the accepting, healing the grieving, and making a stronger, wiser person of those that survived (sometimes a beautiful maiden conveniently turns up to help). Searching for an explanation, I believe that the memory of living in the forest is still strong in our species. Jungles and forests are where we came from in primate evolutionary terms. They are where we cache our wildness now. Literally they are our life breath for the future. But for me they will always be a symbol of what we love and reject, our own wild nature, our connection with all other forms of life. The draping branches tangle sight and scent.